What an amazing evening it was at the Lanarkshire Philatelic Society on Friday, 3rd October . The guest speaker was Mr. Jack Murray of the Glasgow Philatelic Society who was giving a display entitled "Victoria Cross". 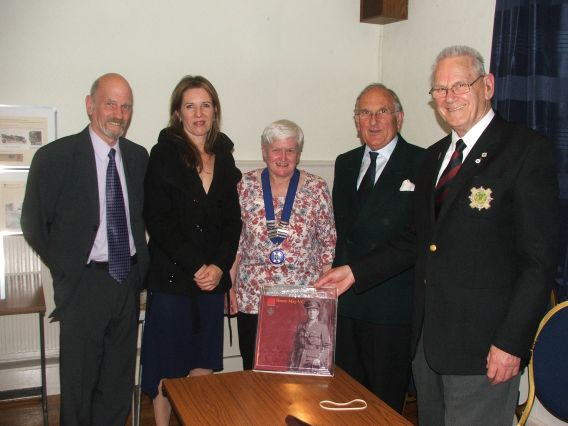 Distinguished visitors were welcomed to the meeting – Major Ian Farquharson of the Cameronians; Mr James McInnes & Ms Jennifer McInnes, Grandson and Great-granddaughter of Henry May VC; and Mr. William Brockie. Using many stamps, covers, postmarks and postcards, Jack gave a truly wonderful display of this subject. He began with the institution, during the Crimean War, of the VC by Queen Victoria – to be awarded for feats of outstanding bravery. On 26th June, 1856, the Queen, in Hyde Park, invested 62 (of the 111) Crimean War recipients with the medal. This included Midshipman Charles Lucas, the first man to be nominated for the award, who threw a live shell overboard from the steam sloop "Hecla" on 21st June 1854 thus saving the lives of all on board. The first man to physically receive the award was Col. Henry Raby for his action of saving a severely wounded soldier while under constant fire. The display continued with illustrations of many who, through the reigns of 6 British monarchs, have been awarded the medal. This included Lieutenant Henry May, who was born in Bridgeton, Glasgow. He joined the Cameronians (Scottish Rifles) and, as a Private, on 22nd October, 1914, near La Boutillerie, rescued a badly wounded soldier by dragging him some 300 yards while under fire. He had already attempted to rescue another who died before May could reach him. His VC medal is now held in the Cameronian Museum in Hamilton – and he is buried in Riddrie Cemetery. Also illustrated was Private Robert Downie who lived and worked in Springburn, Glasgow. He joined the Royal Dublin Fusiliers (British Army) and showed immense bravery in the face of enemy fire in October, 1916, near Lesboeufs, France, when he captured a German machine gun. On his arrival home to Central Station on Hogmanay 1916, he was carried shoulder high to the taxi. Springburn Road was decorated with bunting. His medal is held at Celtic Park. He is buried in St Kentigern Cemetery. The "most decorated war Hero" of World War 1 is Lance Cpl William Harold Coltman, a Stretcher Bearer in the 1st Battalion North Staffordshire Regiment. During the tea break, Major Ian Farquharson of the Cameronians (Scottish Rifles) was presented with a book about Lieutenant Henry May VC. This was very gratefully received. For the Millennium a new Memorial was unveiled in Carluke Public Park. This is to three Carluke men who were awarded the VC. In his second round Jack displayed much postal material relating to the 3 men. 2 won the medal in the First World War and the other in the Second. Lance Corporal William Angus joined the Royal Highland Fusiliers 8th (Lanark) Battalion, and, on 12th June, 1915, at Givenchy, France, left his trench under heavy bomb and rifle fire to rescue Lt James Martin, (who was also from Carluke), and was lying badly wounded near the German line. Angus succeeded but sustained severe wounds himself – causing the loss of an eye and part of a foot. King George V awarded him the VC at Buckingham Palace in August 1915. His medal is in the National War Museum at Edinburgh Castle. He is buried in Wilton Cemetery, Carluke. Sergeant Thomas Caldwell joined the 12th Battalion Royal Scots Fusiliers and, on 31st October, 1918 at Audenarde, Belgium he rushed, under heavy artillery fire, at the enemy position and captured it single-handedly, along with 18 prisoners. His medal is in the Museum of the Royal Highland Fusiliers in Glasgow. He died in Adelaide, Australia and cremated at the Centennial Park Crematorium. Lieutenant Donald Cameron joined the Royal Naval Reserve. On 22nd September, 1943 he commanded Midget Submarine X6 and, after dodging a minefield, nets, gun defences and enemy listening posts, he laid charges beneath the German battleship, "Tirpitz", and the resulting explosion caused the ship to be out of action for many months. For his outstanding gallantry and leadership he was awarded his VC by King George VI in 1944. He died in hospital, age 45, at Haslar, Hampshire in 1961. His ashes were buried at sea from HMS Thule in April, 1961. In 1956, Queen Elizabeth II invited VC holders and the relatives of posthumously awarded medals – as well as relatives of those winners who had died – to a special reception to celebrate the Centenary year of the institution of the Victoria Cross. People arrived by ship, plane, et al, to be reunited with comrades they had not seen for years. All joined in the special Review in Hyde Park on 26th June, 1956. This date being reminiscent of the investment ceremony in Hyde Park by Queen Victoria on the same date in 1856. Jack ended his display with postcards etc outlining the emotive account of how the "Unknown Soldier" – was chosen from British servicemen exhumed from 4 battle areas in France. The coffin, with solemn ceremony, was brought across to London and there on 11th November, 1920, it was taken on a gun carriage through crowds to the Cenotaph at Whitehall. There, the King laid a wreath on the coffin which was then carried to Westminster Abbey where it was buried, having been carried through a guard of honour formed by 100 VC holders. Dr Brian Dow, who lives in Carluke, led members in the Vote of Thanks to Jack Murray for giving such a wonderfully evocative account of the award of the Victoria Cross. Our next meeting in the Caledonian Bowling Club, Motherwell Road, Hamilton, is on Friday, 10th October, at 7:30pm when members will give their displays on the subject of "Africa". Major Ian Farquharson (Cameronians [Scottish Rifles]) and Jack Murray who gave the display.